The aim of the Midsummer Boulevard East workshops was to come up with ideas to make this part of the city centre a more appealing place for residents, shoppers and visitors, both day and night, and to improve connections between central facilities and attractions. The overarching intention was to ensure that by 2026 Midsummer Boulevard East will make an enhanced positive contribution to the economic, social and environmental improvement of the Primary Shopping Area within CMK. The Workshops are part of a wider initiative looking at improvements to how the main shopping area of Central Milton Keynes (CMK) looks and functions; for example, how people move around and how we can create more attractive outdoor spaces which complement the shopping experience. An overall aim was to avoid a prescriptive approach but to provide generic principles, ideas and proposals that could form the rationale to direct and support subsequent detailed proposals. 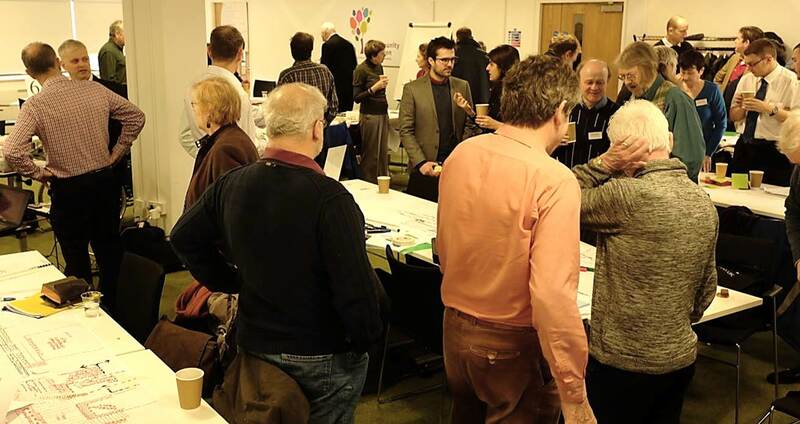 Around 80 people, including members of the public, the business community, Milton Keynes Council, parish councillors, and grassroots campaign groups met together for the first time in February 2014 and for a second time in June 2014 to discuss Midsummer Boulevard East – the important 1km stretch through the main shopping district between Midsummer Place and Campbell Park. Our intentions was to be as inclusive as possible, within the constraints of accommodating a large number of people in plenary and break-out sessions. In addition, a public exhibition was held before the first workshop in February, to engage more members of the public in the overall process. A workshop website is also being developed to give an opportunity for more people in the community to participate in an online ‘public exhibition’ . The Midsummer Boulevard Workshops were a joint initiative by Milton Keynes Council and CMK Town Council. Contributions in kind (staff from MK Council/MKDP; volunteers from CMK Town Council; consultants provided by landowner/developer interests).